Earlier this week Garden Girl went on her very first school trip. It was just to the local park to look at the changing season, but that is far enough for a nursery class. I wasn't allowed to help out as they didn't want younger siblings to go along, so I have to admit that it took a lot of self restraint not to go for a walk in the park myself that morning and take up camp behind a large bush with my binoculars. But in the event she was in a small group of 3, with her best friends Mum, so I had nothing to worry about. Back when I was a little girl, school trips consisted of an annual trip to a local museum, usually just before Christmas as a treat. Nowadays schools seem to be a lot more inventive and make good use of local resources. They even take the children on a trip to the local supermarket. I'll be sending Garden Girl into school with my shopping list that day! And for all the worry that a trip out causes I think school trips are a brilliant idea. Garden Girl came home from school that day absolutely full of her walk to the park. She held hands with her best friend and they collected leaves and sticks and conkers, which they have since used to make leaf people. They watched the squirrels and the ducks and peered into rabbit holes. They talked about the falling leaves and the different colours of autumn. 'We didn't even have time to play' Garden Girl said happily at the end of her excited tale. 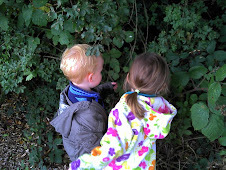 So knowing just how much a nature day can motivate and enthuse a four year old I was really interested to hear about OMSCo's Hedgerow Safari's for school children. 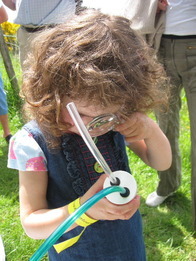 OMSCo is Britain's largest supplier of organic milk and to help educate children about organic farming and the environment they have been running Hedgerow Safari's on their farms throughout 2010 completely free of charge for school groups. 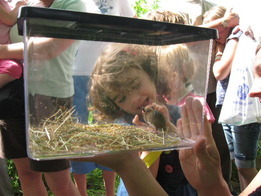 During the trip, school children are able to see close up some of the small mammals that inhabit the hedgerow such as a woodmouse, bank vole or common shrew. Then, using some Hedgerow Guides (produced jointly by OMSCo and the Field Studies Council) they can identify plant species, before using sweep nets, pooters and magnifying glasses to examine any insects they find. And of course fresh organic milk is provided for the children to drink with their pack lunches. I would find this hugely interesting myself, let alone the children! But, knowing how much our Little Garden Helpers enjoy outdoor activities OMSCo very kindly sent us all the bits and pieces the children use on the hedgerow safaris to try our ourselves, along with a pair of wellies and raincoat each and we will be taking the pooters, magnifying glasses, clip boards and hedgerow guides out with us this weekend on our own mini hedgerow safari. I will let you know what we find, but if your children are in Key Stage 2 do mention these trips to your school. The trips are entirely free of charge so the only thing your school will ask you to pay for is transport costs and your children will have what sounds like a brilliant day outdoors. Win win all round. Further information about the Hedgerow Safari's can be found on the OMSCo website.